Well, not exactly. The Palmer Vineyards wine club arranged our seasonal pickup of wine club selections with the fourth annual Paella dinner. On a soft warm evening on the North Fork, the wine and food were great, and the wine club vibe was friendly. Palmer winemaker, and native Spaniard Miguel Martin produces some excellent wines, and his wife Ellen again delivered delicious Paella. 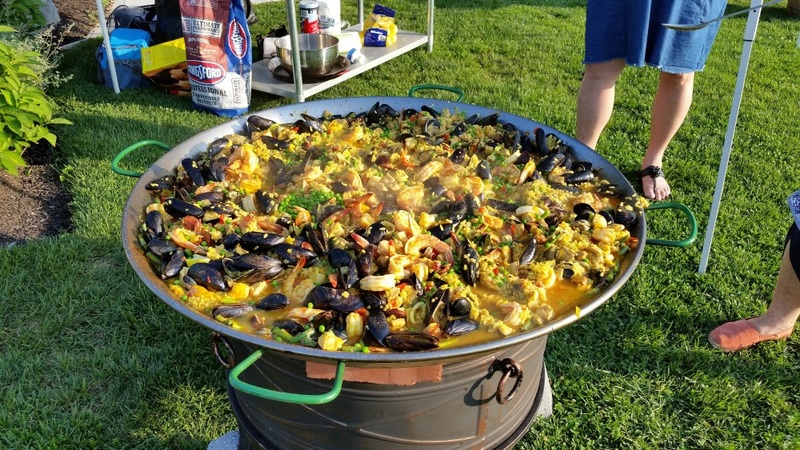 This year, Palmer closed the winery and made the Paella and Pickup evening a private affair for wine club members only. This was an important change that kept the event calmer, and less overwhelming. Wine club manager Patrick Cereola told me the club had grown to over 300 members, and the club has adapted to its success. Will you be at next year’s dinner as a fellow wine club member? Hmm, with plenty of Palmer rose on hand, I think it’s time to get out my paellera, stoke up the Weber, and get busy making my own version of this delish dish. Until our next trip around town, enjoy the beautiful East End!